You all should be so proud of me, because let me tell you, it was awfully hard to pass up the sticks I saw in Crate and Barrel. They yelled at me from across the room....and I wanted them....but I resisted! ....and brought them home. There is only so much I can resist and when they smiled and cooed at me...my heart was gone. I have loved on them, talked to them and told them how adorable they are....don't you think so?! BTW, I left James at the store! These are adorable. I am going to have to pick some up. LOVVVE! Thanks for sharing. Hugs! Thank you so much! I was going to photograph my stash, but found this much cuter photo online. I'm going to get the hubster to make me some more since I only bought 6. That means, I get to buy more sticks! :-) Hugs!! i do hope they're not varnished or treated. so they will still have the smell of the forest! They are not treated at all and have a wonderful scent! They are just so rustic looking and some of the bark even flakes off…they are just perfect! Love and hugs!! Thank you ma'am! I was so excited to run across these little gems! Hugs!! Precious. You crack me up. Thank you and thank you! You make me laugh too chick – you have a wonderful sense of humor! Hugs!! Sweet! But I'm noticing that you're moving on to larger wood items now. What's next, Benita? The hubster is sort of happy that I’m gravitating towards wooden objects that I don’t want to paint…LOL. If they coo then you absolutely have to bring them home! How adorable! 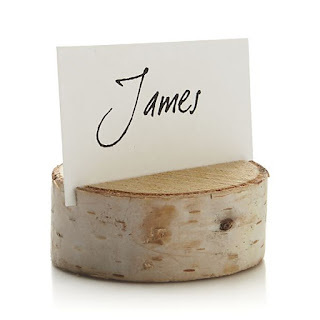 Are they really just the right size for place cards? How cute! Thank you and yes, they are. They are small little wedges from tree limbs...crumbling bark and all. I can't wait to use them. One of my friends on FB said they could also be used to display smaller photos and possibly Christmas cards. Thank you ma’am….LOL…..yes, they will go perfectly with the sticks! And I will get the hubster to make me a few more….I just need to find the right sticks for the additions! Aren’t they too cute?! And I do believe it is birch or at least that was my first thought. I do wish I could find a few limbs of this that I didn’t have to purchase, as I would really like some more of these little place card holders. I don’t blame you one bit, I would have grabbed everything I could also. Love and hugs to you sweet friend…try to stay out of trouble this weekend!! Very sweet decor for Fall! You have me picking out sticks now! Although I have had a pot full of them on my front porch since last year, I still want more. What is that?! You are so cute, Benita :) I love your stumps! And James is missing out if he didn't get to come home with you. Stumps - the grown-up version of sticks. You are progressing. Of course, Christmas is coming so a tree would be next in line. Decorated with wood slices.Are you a lumberjill in real life? -gigggggles- You are too funnny for words!!! Hubster must have a happy life! LOL...there is something that just sounds so wrong about that! ;-) But you are right, so many wonderful ideas...that's one of the great things about blogging...bouncing ideas around and getting new perspectives! :-) Hugs!! I took a picture of these at Crate & Barrel a couple of weeks ago because I have some logs in my garage that I want 'my hubster' to cut for me...I have a couple of projects to do with the logs that I want him to help me with and this was one of them. I thought they were so cute and think they will be super easy to make. I think DD's Cottage is onto something...you need a tree! Inside! LOL! LOL @ us....those like minds again!! I think these are adorable and how awesome that you have some branches that you can use. I don't have any yet, but do plan on snatching a few from down the street if I can get to them before the construction crew burns them all. They do look easy to make. I'm so glad I'm not the only one wanting to decorate with sticks and stumps...LOL...and yes, it will make the hubster happy...he thinks I've lost it! I hope you had a wonderful, fun-filled weekend! Big Hugs back at ya!! I immediately thought of people with missing limbs. What you have are beautiful birch wood slices from about a 3-4” branch. To demonstrate the dif, here is an example from the top of my list to Santa this year –a Wood Stump so I can build an Alfresco Table like this – prepare to swoon! Don’t tell the Hubster you have blog friends in low places, but one of my brother in law’s businesses is a Stump Removal/Tree Trimming business and if I play my cards right, I have a good chance of getting this stump under the Xmas Tree! If you are a serious stick lover you need to hookup with someone in that business in your area. That is the easy part but- sob, knowing that you cannot save every stick, branch and stump from the chipper and grinder – that is the hard part – you have to be strong my friend or just “stick” to retail! LOL ! I will not tell the hubster I am being led further astray by my blog friends....and I do believe Garth had a very popular song about this very thing! ;-) Hugs!! lol. you're too funny. but what are sticks? Well, you had an exciting day, Benita. Love the stumps. It was an interesting day, that’s for sure! But Crate and Barrel and Pottery Barn are 2 great stores to window shop! Hugs!! Love these Benita ;) Happy weekend! Thank you so much Cecilia! I thought they were adorable and I'm going to find some sticks so the hubster can make more for me! Hope you had a fabulous weekend! Hugs!! So cute! Everyone needs a stump and some sticks! Thank you so much! I totally agree Sherry! Hope you had a great weekend! !